This was the original concept sketch. The idea behind The Word Made Flesh is a simple one, and yet, more complex, the more you think about it. 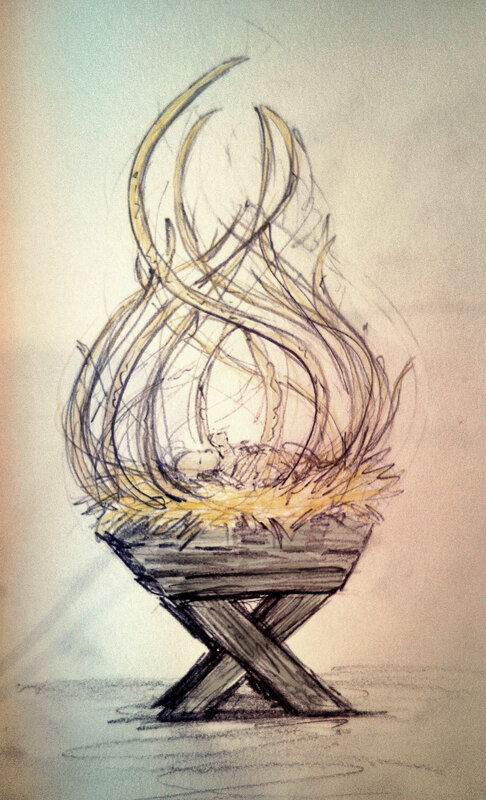 The image of a baby in a manger is an idea that we are so familiar with as a culture, that we rarely pause to think about the strangeness of this image. Yet, the Christian implications of this image are baffling. This baby is God incarnate. This is God, who created the heavens and the earth, who is all-knowing, all-powerful, all present. This is God, whose very existence the human mind cannot fully grasp. This is a holy, intangible, incomprehensible God made into tangible, comprehensible, human flesh. Not only is this God as a human, but God as a helpless human baby, and THEN God as a helpless, human baby in a feeding trough for animals. Calling this image “odd” is an understatement. Even so, this image represents so much to the Christian faith. The fact that God is willing to come down to our level to save us, and be with us shows the extent of his enduring love for us.